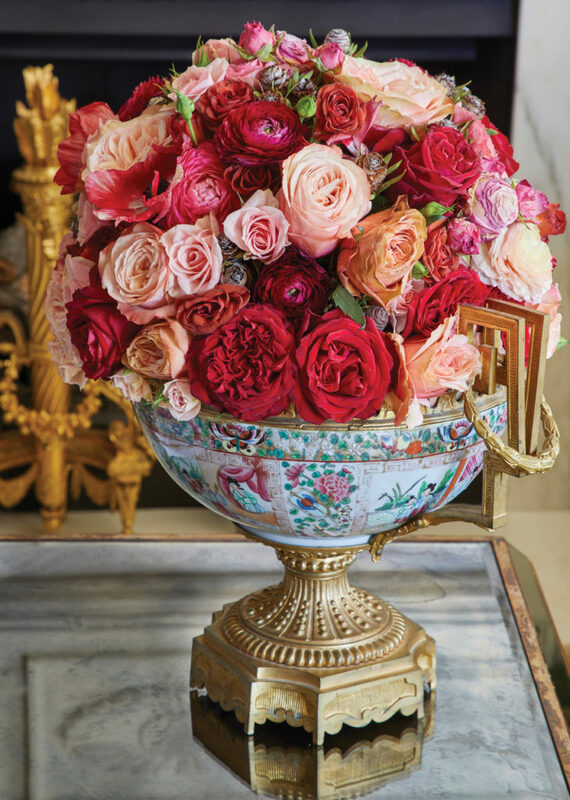 Sybil Sylvester brought the wow factor to her friends’ antiques-filled condo by decorating it in unexpected colors and filling it with fresh flowers and lots of lush greenery. 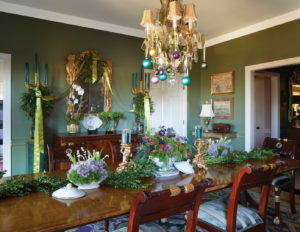 Although we all want to get the decorations up early in the month, I recommend waiting to put greenery inside until the middle of December so it does not dry out and lose its beauty. I know it’s hard to wait, so placate yourself by decorating the outside of your home with wreaths and garlands at the beginning of the month. Step outside your house and gather greenery, vines, berries, and branches. You’ll save money, and the just-plucked items from your yard will be fresher than those from the nursery—and they may last longer. For Chris’s home, “more is more” worked because of the style of his interiors. However, if your décor is more contemporary, keep it simple and use a lot of greenery, ivy, and magnolia leaves. I like to spray-paint them in metallic finishes—silver, copper, or gold. Mix the sprayed pieces in with the evergreens for a subtle shine. If you are entertaining a crowd, you want to make sure your decorations are visible. 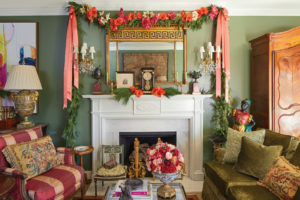 That’s why we hung the garland on the crown molding in the living room and decorated the tops of mirrors and the chandelier in the dining room. The height allows everyone in the room to see the festive décor. As far as the color palette, anything goes these days! Last year, we did an ombre Christmas tree. It started out white on the bottom, then went to pink, peach, coral, and finally white on top. And you don’t have to do the same thing every year. Experiment and have fun—that’s the most important part!